Best Curacao beaches are famous for their picturesque scenery which includes plenty of sea cliffs and gorgeous calm bays. When you visit Curacao you will thoroughly enjoy the white sand beaches and the amenities at each location. You can find solitude at Curacao beaches on the northwestern coastline at places like Kenepa and Playa Lagun or you can choose a livelier beach like Mambo where you can shop and dine as well as lounge on the white sand. C You can indulge in other activities on these pristine beaches such as swimming, snorkeling and scuba diving or you can just take some photographs as well as lounge on the beautiful white sand. Scroll down to see the map of best beaches in Curacao! 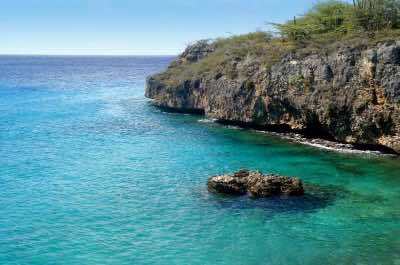 Snorkeling and diving in a secluded spot is a delightful thing to do in Curacao. Playa Kalki provides the perfect venue! This picture-perfect setting offers a small sandy cove surrounded by massive limestone cliffs. The water is calm and shallow with myriads of rocky pools harbouring fascinating marine animals, corals and sponges. Get your snorkel or diving gear from the dive shop and explore the underwater world. The famous reef known as Alice in Wonderland can be reached from Playa Kalki beach and offers a magical experience. If you prefer to remain dry, try some sunbathing, take a walk or relax in the small restaurant and enjoy a plate of local fare. 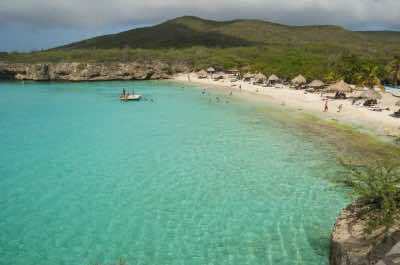 Playa Lagun is a fantastic choice for a Curacao beach when you are seeking smaller crowds in and out of the water. Located on the northwestern shoreline of island near the village of Lagoon, Playa Lagun is situated in a bay which has stunning cliffs on each side and a lush tropical landscape. You will enjoy the laid-back atmosphere at this white sand beach which typically has fewer tourists and more locals enjoying the numerous activities. Playa Lagun has excellent swimming with calm warm waters and you can gear up at the onsite dive shop if you want to snorkel or scuba dive. Once under the water you will be amazed at the marine life and beautiful coral reefs you can explore just a short distance from shore. You can enjoy a great island beverage and nice lunch at the beachside restaurant or you can lounge about a picnic table with your own basket at Playa Lagun. Kenepa Beach, also known as - Playa Kenepa - Or Klein Knip - is one of those must see Curacao beaches when you want a lively atmosphere and plenty of activities to occupy your time. Located on the northwestern coastline of the island near Logan and Sabana Westpunt, Kenepa Beach has breathtaking tropical scenery which is highlighted by white sand and numerous cliffs. Generally, Kenepa Beach has fewer crowds and offers an escape into solitude with a little bit of attitude. 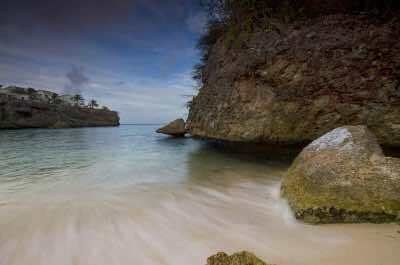 You can enjoy two distinct beach areas at Kenepa Beach which are separated by cliffs as well as tropical vegetation. You can enjoy swimming and snorkeling as well as scuba diving just offshore where you will explore the interesting underwater marine life. If you like cliff diving, you can take the trail to the top and dive into the beautiful water or perhaps just snap a photograph. You and your family will like the wide stretches of white sand where you can play, lounge in the sun or relax under a thatched palapa. If you forgot your lunch there is a small snack grill and bar at Kenepa Beach that serves delicious libations and beach fare. Mambo Beach is a great Curacao beach for families and travelers who are seeking a lively atmosphere on a perfect stretch of white sand. Located on the western coastline of the island along St. Anna Bay near the Curacao Sea Aquarium, Mambo Beach has something for everyone. Mambo Beach allows you to relax under a thatched roof palapa while the kids build a sand castle or swim in the calm blue waters. Mambo Beach has superb amenities which includes shopping at Tiffany’s and Company as well as plenty of fine restaurants such as the Madero Ocean Club. Mambo Beach also offers plenty of watersport adventure from snorkeling to scuba diving to jet skiing. 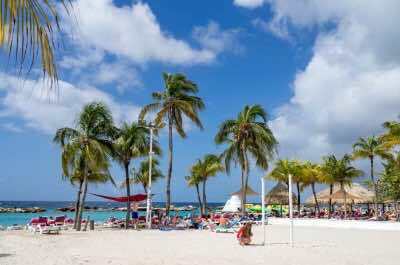 You can spend as much time as you like at this beach or combine day with a fabulous tour of Willemstad. 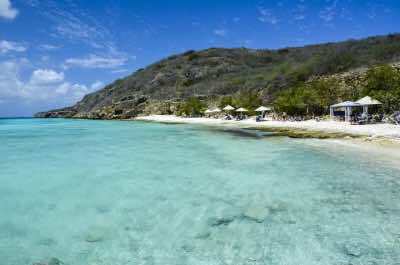 Mambo Beach is a must stop for ay traveler on Curacao. Playa Cas Abou is a nice Curacao beach which offers families a great option to spend the day on the white sand and playing in the warm Caribbean waters. Located on the western shoreline of the island near Fontein, Playa Cas Abou is a favorite with locals and tourists because of the beautiful scenery of blue waters as well as shoreline cliffs. You will love the soft white sand at this beach and there are plenty of spots for shade under wonderful thatched roof palapas. Playa Cas Abou is an ideal place for you to go snorkeling and swimming where you will view numerous brightly colored tropical fish as well as other marine life such as sea turtles. You can also rent a variety of motorized and non-motorized watersport equipment at Playa Cas Abou which will keep you entertained all day. When you get hungry there is a small Beach Bar and Restaurant that will satisfy your thirst with a cold beverage as well as food. Playa Porto Marie is a perfect Curacao beach for families and travelers who are looking for lots of amenities onsite including a dive shop. Located on the western coastline of the island near St. Willibrordus, Playa Porto Marie has beautiful white sand and a tropical attitude. Playa Porto Marie will satisfy all you dreams of clear Caribbean water, soft white sand and great times in the sun. You can rent all-types of watersport adventures including snorkeling and scuba diving where you will view brightly colored marine life including sea turtles as well as numerous double reefs just offshore. The natural beauty of Playa Porto Marie will amaze all of your senses while you enjoy this incredible beach. An added bonus here is the three hiking trails which will take into a jungle paradise where you can nature at its finest. You can also enjoy unique food and drink options at the onsite restaurant which serves great grilled cuisine. Jan Thiel Beach is a nice Curacao beach for you to spend the day with the family enjoying all-types of watersport activities. Located on the southeastern shoreline of the island, Jan Thiel Beach has numerous amenities onsite and is associated with the Jan Thiel Resort. Jan Thiel Beach will charge you a small fee to enter this white sand wonderland. Once at Jan Thiel Beach you can find one of the many beach beds to lounge on and enjoy the beautiful calm waters. You can rent just about all-types of watersport adventures at Jan Thiel Beach and the swimming here is fantastic whether you are in the ocean or the saltwater Infinity swimming pool. The Jan Thiel Beach can be busy at times with tourists but this should not stop you from having fun in the sun. This European-style beach has several restaurants such as Zest Mediterranean and Tinto where you will find exquisite South American cuisine. 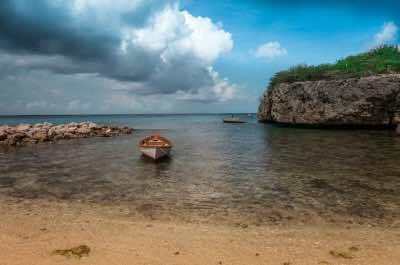 Playa Jeremi is the perfect Curacao beach for you when seclusion, natural beauty and clear blue water are important. 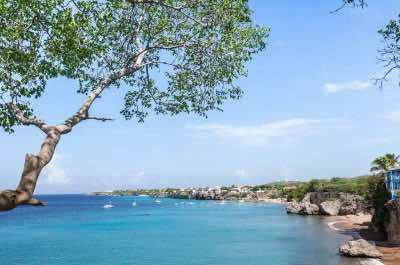 Located on the northwestern shoreline of the island between Lagun and Sabina Westpunt, Playa Jeremi is picturesque and is surrounded by mangrove forests. This stretch of beach has cream colored sand and is rocky in some parts with small cliffs on each side of the cove. You can swim and snorkel in the warm blue waters and view several species of marine life including sea turtles at Playa Jeremi. You can lounge on the sand and soak up the sun on this uncrowded beach. Playa Jeremi is a favorite with locals that are looking to swim and have fun. If you like to hike then take a walk into the Landhuis Kenepa Plantation which is nearby. You will need to come prepared to Playa Jeremi because there are not any facilities but if you get hungry you can try Rancho El Sobrino Restaurant where you will find innovative Caribbean-style cuisine. Daaibooi Beach is a spectacular stretch of sand that is a great Curacao beach which is a favorite with locals and all travelers. 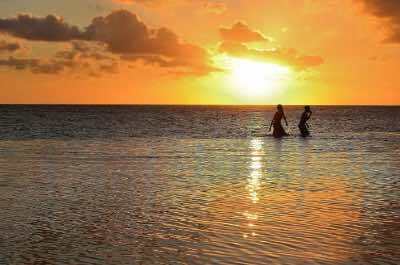 Located on the western coastline of the island near the village of St. Willibrordus, Daaibooi Beach has everything from seclusion to swimming to snorkeling. Daaibooi Beach is situated in a tropical paradise with plenty of palm trees and natural vegetation for shade as well as an assortment of thatched roof palapas. Daaibooi Beach is off the beaten track and is one of the most pristine beaches with excellent facilities for you to enjoy. The white sand is perfect for playing games, building sand castles and the water is ideal for swimming as well as snorkeling. If that is not enough, you can even scuba dive here with multiple shore dives available. You can indulge in cold beverages and a great lunch at Daaibooi Beach Bar or an excellent sunset dinner at Playa Porto Mari.